Here is best "SRI LANKA VS SOUTH AFRICA" , firstt ODI match,(SouthAfrica tour of Bangladesh), DREAM11 Predictions for the Fantasy user ,who venue are looking to make a strong team for maximum win. We are providing latest news, match update, information about the match .The team is picked by using various factors on the basis of performance, ground stats and latest form. 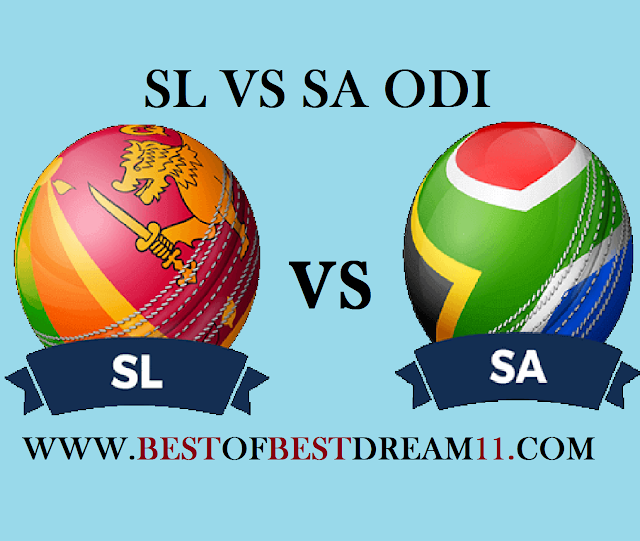 to the ODI format as Sunday sees the start of the five match odi series against Srilanka .The recent performance of Protease has been very bad. Sri Lanka's team is very excited after winning the test series by 2-0.They will have the advantage of playing in their home.They will try to create history in the captaincy of Angelo Mathews. 1-for Sri Lanka,Thisara Parere's performance has been great this year,in the previous odi series, he scored a magnificent 134 runs at an average of 44.66. 2-SL captain Angelo Mathews and Upal Tharanga are very good batsman for their team. 4- for South Africa, Hashim Amla is the most successful batsman against Srilanka,he has scored at an average of 70.60. 5-Faf Du Plessis is also in the good form ,they have played good inning in the last match. 6-SA will also have great hopes from JP Duminy and Quanton De Kock. 7- in bowling, Lungi Nagidi and Kagiso Rabada will be very crucial. Heinrich Klaasen picked up a groin strain and sat out the tour match,but is expectedto be fit for the first ODI.